NEW YORK CITY (March 26, 2013) – Hey kids, parents, teachers, and comic fans, the KIDS COMIC CON 7 (KCC 7) is rocketing to earth on Saturday, May 11 at Bronx Community College from 10 a.m to 6 p.m.
Why the outer space reference? Because this year our theme is: Sci-Fact to Sci-Fiction, Where Creativity and Technology Meet. Kids will be able to meet with over 30 acclaimed artists who use different forms of science and technology to create comics, animation, video games, puppets, and more. And this year admission is totally FREE — making the KIDS COMIC CON one of the best entertainment values around! Artists will also join Ronald McDonald House NY, and others, in its fight for children, against cancer. KCC creator and founder Alex Simmons, writer for Archie, Scooby-Doo, and Tarzan, among others, said he’s particularly excited about this year’s KIDS COMIC CON. KCC 7 Patrolled By NEW CRUSADERS! This year, the creators of Archie Comics’ sci-fi superheroes will be there to answer questions, sketch, and share an inside peek of their creation. Around the Corner to SESAME STREET! Come meet members of the Jim Henson/Sesame Street creative team. Learn how they work with the Muppets, and much more. Expand your reading library with an on-site SCHOLASTIC BOOK FAIR! Representatives from Scholastic will be on hand with special offers just for KCC attendees! Notable guests at this year’s event include veteran editors Jim Salicrup and Joan Hilty, artist Rick Parker, Louis Mitchell and Diana Leto from Sesame Workshop, Karen Falk from the Jim Henson Company and a variety of writers, artists and editors from Archie Comics including Suzannah Rowntree, Alex Simmons, Jamal Peppers, Alitha Martinez, Ryan Jampole, Joe Morciglio, Angelo DeCesare and Paul Castiglia. 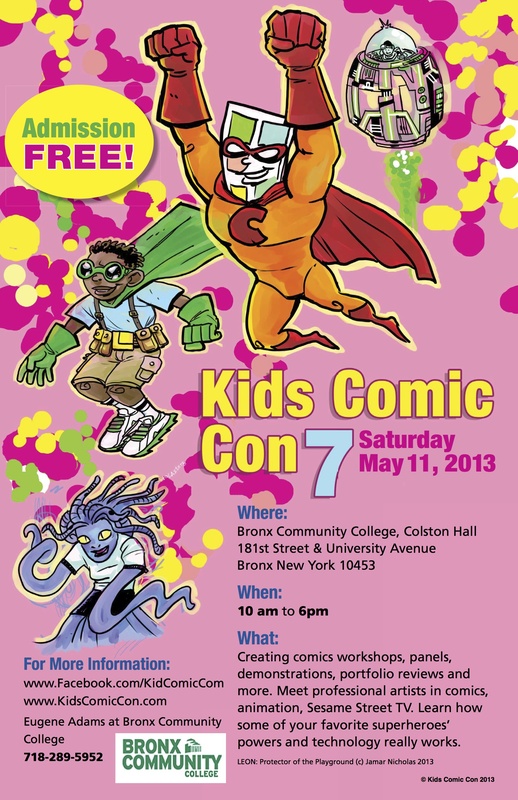 The 2013 KIDS COMIC CON is set for May 11 at Bronx Community College, 181st Street and University Avenue, Bronx, NY from 10 a.m to 6 p.m. Admission is FREE. For additional information, please visit www.facebook.com/KidsComicCon. Posted by hatlentore in Comics/Graphics Novels, General Comments. ‘Mouse Guard’ creator David Petersen invites a new group of creators to come and play in his sandbox in this new, four-issue miniseries! Los Angeles, CA (March 20, 2013) – New legends will be forged! 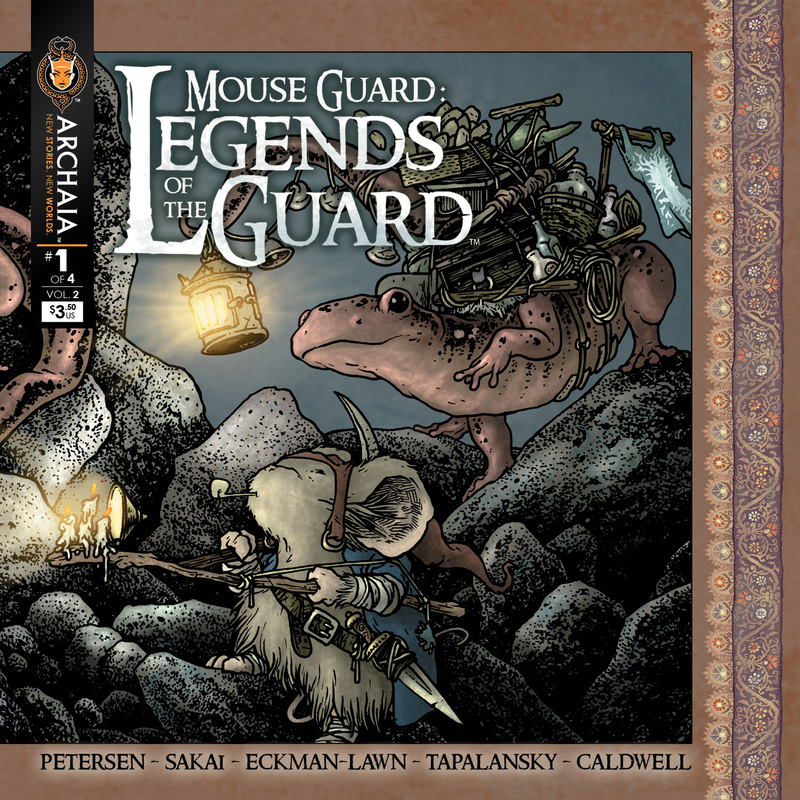 Award-winning publisher Archaia Entertainment is excited to announce the launch of Volume 2 of the Eisner Awardwinning anthology miniseries Mouse Guard: Legends of the Guard. The first of four issues is set to debut in May 2013. Mouse Guard is the best-selling fantasy comic book series created by Michigan-based David Petersen about a group of elite warrior mice who serve to protect and guide the common mice under their care. “After winning the Eisner Award for the first volume, the talent that David has brought to the table for the second volume of Legends is incredible,” said Stephen Christy, Editor-in-Chief of Archaia. “Between industry legends like Stan Sakai, Bill Willingham, and Rick Geary to amazing up-and-comers like Cory Godbey, Mouse Guard fans are going to have a lot to look forward to in this miniseries.” As in the first volume, Mouse Guard: Legends of the Guard Vol. 2 finds a group of mice at the June Alley Inn trying to outdo one another in a storytelling competition, spinning typically fantastic tales of the Mouse Guard and their adventures. After all, the mouse that tells the best story gets their bar tab cleared! Petersen writes and illustrates the tavern scenes, while each contributor (or team of contributors) writes and illustrates the different mouse tales. Petersen has assembled another all-star lineup for this four-issue miniseries. The contributors to issue #1 of Mouse Guard: Legends of the Guard Vol. 2 include Stan Sakai (Usagi Yojimbo), Ben Caldwell (The Dare Detectives! ), and the team of writer Nick Tapalansky and illustrator Alex Eckman-Lawn (Awakening). Subsequent issues will include contributions from Christian Slade (Korgi), Rick Geary (The Adventures of Blanche), Jemma Salume (Unicorn Life Cycle), Jackson Sze (concept art on films like The Avengers and Iron Man 3), Cory Godbey (Fraggle Rock, the upcoming Jim Henson’s Labyrinth), Eric Canete (Fear Itself: Spider-Man), C.P. Wilson III (The Stuff of Legend), Bill Willingham (Fables), and fantasy illustrator Justin Gerard. The first volume of Mouse Guard: Legends of the Guard spent five weeks on The New York Times Best Sellers list and won the Eisner Award for Best Anthology in 2011. A new printing will be available for sale in June (ISBN: 978-1-932386-94-3; Diamond Order Code MAR130807). Mouse Guard: Legends of the Guard Vol. 2 issue #1 is available for pre-order now at your local comic book shop. To pre-order, provide your retailer with this Diamond Order Code: MAR130802. To find your closest comic book shop, visit http://www.comicshoplocator.com. Archaia is a multi-award-winning graphic novel publisher with more than 75 renowned publishing brands, including such domestic and international hits as Mouse Guard, Rust, Cow Boy, Cursed Pirate Girl, Gunnerkrigg Court, and Artesia. Archaia has also published an entire line of graphic novels in partnership with The Jim Henson Company, including the multiple award-winning Jim Henson’s Tale of Sand and such beloved tales as The Dark Crystal, The Storyteller, and Fraggle Rock. Alongside these celebrated titles, Archaia has released English translations of numerous renowned foreign titles to much fanfare, including The Killer, Sergio Toppi’s Sharaz-De, and The Secret History. In 2012, Archaia was honored with six Harvey Award nominations, two Harvey Awards, six Eisner nominations, and three Eisner Awards (Jim Henson’s Tale of Sand won for Best Graphic Album–New, Best Penciller/Inker, and Best Publication Design). Also in 2012, Archaia earned both Gold and Silver awards from ForeWord Reviews. Archaia was honored with nine 2011 Eisner Awards nominations and two Eisner Awards for Best Graphic Album and Best Anthology. meaningful, transformative content, building one of the industry’s most visually stunning and eclectic slates of graphic novels. Rebecca is spending time in the country with her father, and Ernest of course, when things begin to change. Rebecca befriends a boy who is her age, and she sees her sister leave to return to the city on her own. 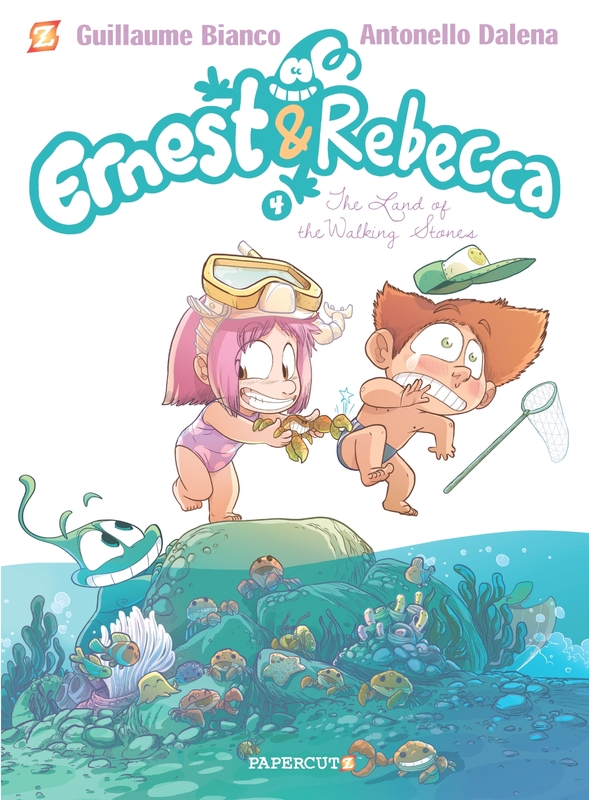 Will Ernest & Rebecca’s friendship survive? Posted by hatlentore in Rated E, Video Games. It’s the sort of one-liner that might go over poorly at a comedy club or on a TV show, but in the absurdist world of Lego games – where little yellow men build spaceships out of virtual plastic bricks and shoot pigs out of cannons – it’s hilarious. On hearing it, I’m ashamed to admit I did a spit-take all over my coffee table. Traveller’s Tales Lego games, with their goofy comedy and clever puzzle solving, have for years been a breath of fresh air in a medium dominated by violent shooters and slashers. While the games have been aimed at kids, they’ve also appealed to adults who like their games to be a little lighter on the testosterone. Lego City Undercover is all of that, writ large. It’s also ironically a spoof of one of the most violent and adult-themed of game franchises, Grand Theft Auto. There’s no doubt about it – this is Grand Theft Lego, minus the hookers and drugs. McCain patrols the streets of Lego City, a large, open-world sandbox based on the toy franchise and, more or less, real world San Francisco. Traveller’s Tales made strides toward this sort of open-world concept with its previous two games, Lego Batman 2 and Lego Lord of the Rings, but Undercover sets a new level of grandiosity. Official statements from Nintendo say it’ll take an experienced virtual driver at least 10 minutes to get around the city, but in reality that’s impossible – there’s just too much to see and do. From Chinatown to Albatross Island (more word play, this time on Alcatraz) to the nearby forest and farm lands, the environments are varied, colourful and easy to get lost in while searching for the vast multitude of hidden puzzles and treasures. Helicopters and speed boats also open up new areas both above and below Lego City. Like any good open-world game, it’s easy and worthwhile to get distracted from your main objectives with all the side missions and collectables. One big difference in this game is that many of those side missions are actually inaccessible until the main story has been completed. That’s because, as the game’s title implies, McCain must go undercover in his pursuit of Fury, which leads to a closet-full of disguises that would make the Village People proud. Through the course of the story, McCain dresses up as a construction worker, miner, fireman, farmer, astronaut and burglar. Each disguise confers different special abilities. The astronaut outfit, for example, lets him use teleport pads, while the farmer get-up lets him grab a chicken to glide long distances. Yup, more wacky humour. As in other Lego games, the puzzles are based around figuring out how to use these various abilities in conjunction with each other to reach new sections of a level or to acquire certain items. The story is carved into chapters, which are the more linear-type levels seen in previous Lego games. McCain must traverse the open city to get to these self-contained chapter levels. There’s a lot of driving challenges and some cartoonish fisticuffs, neither of which is particularly hard or exciting. Instead, Lego City Undercoverdraws on puzzles and some exhilarating platforming – McCain often has to scale tall buildings – for its thrills. The humour-packed story is a big draw. Aside from the one-liners, there are also laugh-out-loud spoofs of numerous movies, including The Matrix,Goodfellas and Shawshank Redemption, complete with a voice actor who sounds eerily like Morgan Freeman. Speaking of which, the game features fantastic voice acting in general, with some further great sound-alike performances in specific. A William Shatner impression-as-voice-over provides updates on the snack situation aboard the Lego space shuttle as McCain explores Apollo Island, while an uncanny double for Arnold Schwarzenegger guides the hero through his training as a construction worker. He does so while spouting goofy lines referencing his movies: “I know, it sounds like you got a raw deal… it’s because you’re expendable.” I was laughing myself silly. While McCain often has to break the law to perform his duty, this is still very much a kid-friendly, goody-two-shoes game. When he steals a truck, for example, McCain radios his bosses and requests that they compensate the owners. He’s a good guy through and through – I kept waiting for him to question his loyalties, like the cop protagonist did in last year’s similarly plotted Sleeping Dogs, but it never happens. The story’s finale, which follows another spoof – this time of Aliens – is strangely beautiful. I won’t give away any details, other than to say that the visuals and music combine in a dramatic and moving way. I wasn’t expecting anything like this to show up in a humour-driven game. Just like its predecessors, the end of the main story is really only the beginning of the game in Lego City Undercover, since it’s only then that players have full access to McCain’s abilities. From there, they can delve back into individual chapters to unlock all the previously inaccessible sections, or solve all the other puzzles scattered around the open world. The story took me about 14 hours to complete, and the progress meter showed I was only 24 per cent done. I’m a completionist when it comes to Lego games, which means I’ve got many, many more hours to go. We’re talking Skyrim hours. Lego City Undercover is, at least for now, a Wii U exclusive. So far in the early life cycle of the new console, we’ve seen a number of pre-existing games re-released for it with added features that make use of its advanced controller. In many cases, however, these additions have felt tacked on – they were just extraneous features stretched out to make the gamepad’s many abilities feel relevant. This game feels a little different, with the gamepad incorporated in several interesting ways. For one, McCain gets video calls from his superiors and allies on it. Rather than popping up on the TV screen, communications take place on the controller – there’s a slight element of immersion by having the audio come out of it. The gamepad also doubles as a map of Lego City, which saves you from having to pause the action; a quick glance down tells you where you need to go. It also acts as an augmented reality scanner – hidden secrets can be found by holding the controller up and moving it around. It may be because there’s no other console version to compare against, but the extra abilities here feel natural. While all of those tasks could be accomplished through other means on the PlayStation 3 or Xbox 360, this is one of the better justifications and implementations of the gamepad I’ve seen yet on the Wii U. That said, is Lego City Undercover a system seller? It certainly should be for kids, but that question depends more on what other games are available. So far, the Wii U has been slow in that regard. More games like this would certainly move Nintendo’s console towards hit status. In the meantime, I’m glad I can still enjoy games like this. I love aggressive and gritty adventures as much the next guy, but being able to laugh at silly cartoon characters while figuring out addictive and clever puzzles assures me that I haven’t completely become a crotchety old cynic. At least not yet, I haven’t. Posted by hatlentore in Video Games. In one of the more heartwarming stories you’ll read all week, a dad has hacked Donkey Kong so his three-year-old daughter can play as Pauline and save Mario. Mike Mika is a video game maker by trade, and upon noticing his daughter was disappointed by the default option, simply ‘adjusted’ the classic game so Pauline was now the playable character – complete with a P instead of an M at the top of the screen. Check out the video of Mika’s hack below. Story via Reddit. BURBANK, CA, March 8, 2013—DC Entertainment (DCE), the largest English-language comic book publisher in the world announced today that JUSTICE LEAGUE OF AMERICA #1, written by the acclaimed Geoff Johns and drawn by superstar artist David Finch, was the best-selling comic book to specialty retailers in February 2013, according to information provided by Diamond Comic Distributors. This caps off a hugely successful month for DCE – with robust sales coming via comic retail, book trade and digital channels. JUSTICE LEAGUE OF AMERICA #1 launched in February with a cover featuring the U.S. flag along with 52 variant covers, one for every state plus Washington, D.C. and Puerto Rico. DC Comics is currently sold out of 14 state covers, the digital combo pack and the collector’s bundles containing all the covers. On the bookstore side, February saw DCE publish 15 out of the top 50 titles according to Nielsen Bookscan. Additionally, overall February book trade sales were strong, up 65 percent from last year. Notable sellers include: BATMAN: NIGHT OF THE OWLS, FABLES: CUBS IN TOYLAND Vol. 18 and JUSTICE LEAGUE Vol. 2. On the digital comics front INJUSTICE: GODS AMONG US, the weekly digital-first comic based on the upcoming video game from Warner Bros. Interactive, continues to dominate the charts, selling four out of the top five digital books for the month and seven out of the top 10. BATMAN INC. #8, BATMAN #17 and JUSTICE LEAGUE #17 were also top sellers. Hitting The New York Times Hardcover Bestseller lists in February, DC Comics titles included JUSTICE LEAGUE Vol. 2 appearing at #1, WONDER WOMAN Vol. 2, BATWOMAN Vol. 2, GREEN LANTERN: REVENGE OF THE BLACK HAND, BATMAN: THE COURT OF OWLS, Vertigo’s THE BOOKS OF MAGIC: DELUXE EDITION, and backlist favorites like BATMAN THE KILLING JOKE and ABSOLUTE BATMAN & ROBIN: BATMAN REBORN. While over on The New York Times Paperback Bestsellers lists Vertigo’s FABLES vol. 18 arrived on the list at #1 and DC Comics JUSTICE LEAGUE vol. 1, SUICIDE SQUAD Vol. 2 and backlist favorite WATCHMEN all made appearances in February. Earlier this month, DC Entertainment was acknowledged as the recipient of several Gem Awards including Comic Book Publisher of the Year, Backlist Publisher of the Year and Toy Manufacturer of the Year for 2012 for DC Collectibles. Notably, DC Collectibles spotlighted the We Can Be Heroes initiative with their We Can Be Heroes Justice League 7-Pack, which saw 10 percent of proceeds go to providing relief for the drought and famine in the Horn of Africa. The Gem Awards are recognized within the comic book industry as the pinnacle of sales achievement from Diamond Comic Distributors, the world’s largest distributor of comics, graphic novels and pop culture merchandise. The print comic book version of INJUSTICE GODS AMONG US #2 went back to press for a second printing, while over at DC Comics’ mature readers imprint Vertigo, DJANGO UNCHAINED #1, based on the Academy Award-winning Best Original Screenplay by Quentin Tarantino, went back to press for a third printing. Posted by hatlentore in Uncategorized. What is friendship all about? My Little Pony X MIMOBOT = Friendship is magic! | Mimoco. Posted by hatlentore in Comics/Graphics Novels, Review. has something to do with the fishy pursuers who have followed him from the depths below! The story opens with Mermin waking up on the beach being stared at by 3 kids. He’s happy to have escaped from the Kingdom of Mer. He fights off a shark and is offered a place to stay with one of the kids. Mermin tries to fit in with the other kids and even attends school with them. However, he just doesn’t seem to fit in very well and gets into some trouble with the principal and teachers. He’s been followed to dry land by 3 mysterious fishes that seem intent on capturing him and bringing him back to the sea. 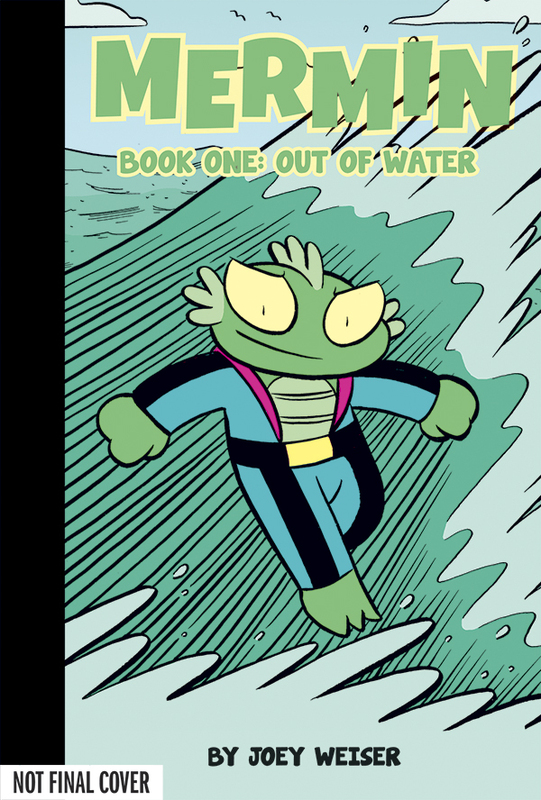 While they track him down, Mermin and his human friends have a few problems of their own as Mermin tries to fit in. Eventually, the three pursuers catch up to him and attempt to bring him home. However, Mermin wants nothing to do with it and battle breaks out on the piers and endangers his friends. I like this book for the simple story telling with out to much extra stuff. The story progresses nicely and logically if you think of Mermin like a new kid in the neighbourhood and he’s trying to fit in. Sure he’s not human but he’s still a kid and just wants to fit in and have fun. The illustrations are cute but expressive. They convey the right kinds of emotions and sense of movement. At times, it’s like reading a newspaper comic-strip but one of the good ones. Is it Right for Kids? Sure is. this is an all ages book that will entertain kids and will also be enjoyable for adults that read it. I would recommend it for kids 10 and under. Older kids might find it a slow read but could still enjoy it.